The Husband and I are planning a trip to visit my parents in Asia this summer. Many of my relatives were unable to make the international trip to our wedding in New York, and thus have never met the Husband. This trip will be a chance for us to do a tour and introduce him to everyone. My parents are even going to have a small banquet for us to celebrate our wedding after the fact. When I called my dad to tell him the dates of our arrival and departure, he said, "Everyone here is really worried about you." "The swine flu epidemic!" he said. "We keep seeing on the news how people are dying in the streets of New York, and how everyone is infected. All of your aunts want to know how bad it is and whether your lives are in danger." "Geez," I answered. "That's just the sensationalistic Asian news media! We're fine!" "Well," he said. "They're taking it seriously here. 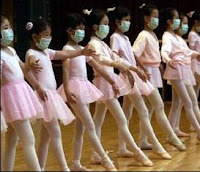 Nobody wants another outbreak like SARS. Make sure you guys bring a couple of face masks on your trip. And passengers on flights from the United States are being tested extensively to see if they have any fevers or coughs or signs of flu! They're taking their temperatures and looking in their throats for signs of infection!" Great, just great. Now I have to be worried about getting strip searched and probed on my way home to see my parents. This coming weekend is a long weekend that we Americans spend in observance of Memorial Day. Amidst all of the barbecues and the beach parties and drinking and carousing, it's easy to forget the true meaning of Memorial Day - that is, to honor our fallen veterans, and remember the price they paid for us to enjoy this long weekend that marks the beginning of summer. Senator Daniel Inouye is one many war veterans who advocate a return of the observance of Memorial Day to the fixed date of May 30. Among war veterans, politicans and all-around good people, Senator Inouye is one of my personal heroes. Here's a video of him talking about some of the shocking prejudice he dealt with after he came back from World War II a decorated veteran, having lost his right arm in battle fighting for the United States. It's important for me personally to remember that I love the United States, warts and all, and I'm proud to be an American. Wherever you are this weekend, take a minute to life up your beer glass to those American heroes who fought and died for us, and those who continue to fight and die for us in this time of war. I have a good friend who is going through a bitter and nasty divorce. His ex-wife is fighting him for more alimony, more child support and sole custody of their kids. More than any other feelings, he feels regretful for ever marrying her. "I should have known by the signs early on," he said. Back when they were planning their wedding, she threatened to call the wedding off if he wouldn't leave his best friend out of the wedding party and make her brother the best man. "Plus, I knew on our wedding night that I'd made a mistake," he added. "Well, we got to our honeymoon suite and I really just wanted to have a quiet moment together to toast champagne and celebrate being married. But she wouldn't do it. She sat there on the bed and counted all of the money we'd gotten. That took her about an hour. Then she recounted to make sure she had the number right, laughed happily and went to sleep." Over the weekend, the Husband and I went to our first NY Mets game in their new stadium. It is very new and fancy. There are endless food options and more luxury boxes and exclusive areas for the corporate fat cats. For us regular people, though, the seating leaves much be desired. The seats are cramped, and the rows are really long. So if you're in the middle of a row, you're constantly inconveniencing other people by stepping over them on your way to the aisles to go to the bathroom, get food, etc. It made me miss Shea Stadium. And angry that perfectly good stadiums are being demolished and unnecessary new stadiums springing up to line the pockets of corporations at taxpayers' expense. Don't get me started on this issue that really drives me crazy. But since Shea is gone, and we have Citi Field now, I have to accept reality. So I took the opportunity to walk around and explore the new stadium. It's hard to see from the photo, but the store is called "Touch: by Alyssa Milano." I guess it was meant to appeal to women whose boyfriends and husbands drag them to baseball games. Rather than spend $48 on a cheap looking sundress with the Mets logo on it, I opted for two orders of sausage and peppers for $14.50. Nothing like getting screwed once as a taxpayer, and twice as a hungry baseball fan. At least the Mets won! Thanks for the well wishes, everyone. My grandmother's funeral is today. I was unable to make it there to attend, but my parents will let me know when they've returned home from it. Over the weekend, I was stuck working both days. On Saturday, I went into the office. About an hour after I'd arrived, I went to the bathroom but forgot to bring my access card. In my office, the bathrooms are in this little alcove next to the service elevators, with card-access-only doors on both sides. So I got trapped in that little space! On both sides, the doors slammed closed and locked me out. I was stuck there for about 20 minutes, unable to figure out how to get out, banging on the door but realizing I was the only person in the office, unable to call out on the internal telephone hanging on the wall, unable to call the access elevator, getting more and more panicked. Finally, I took the only way out that was left to me - I ran out the fire escape, bolting down almost 30 flights of stairs. When I got to the basement, I tripped the motion sensor and WOW! Talk about a loud, shrieking building-wide alarm! I ended up in the lobby of the building, where security people were running around in response to the alarm. I ran in, waving my arms yelling, "It was me, it was me! False alarm!!! I was locked out of my office!" After that, I had to hang out in the lobby for 45 minutes to wait for the management company guy to show up to let me in. "Why is he taking so long?" I asked the guard in the lobby. "Oh, he has to stop at 3 buildings before ours," said the guard. "...for other people who were working on a Saturday and locked themselves out of their offices!"